yasus yasus kalinikta: tender are the planets, tender is the night! i'm stealing this from my friend yoko's website. geocities DOT com SLASH yerkachica. 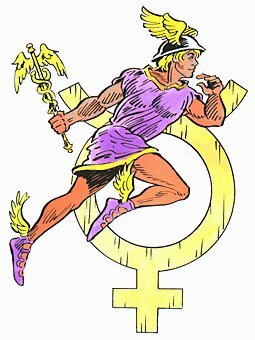 "In general, Mercury rules thinking and perception, processing and disseminating information and all means of communication, commerce and transportation. By extension, Mercury rules people who work in these areas, especially people who work with their minds or their wits: writers and orators, commentators and critics, gossips and spin doctors, tricksters and thieves. It is therefore not wise to make important decisions while Mercury is retrograde, since it is very likely that these decisions will be clouded by misinformation, poor communication and careless thinking. Mercury is all about mental clarity and the power of the mind, so when Mercury is retrograde, these intellectual characteristics tend to be less acute than usual, as the critical faculties are dimmed." This madness should end... March 25th. Geeeeeez. We got awhile. But, I think I'm feeling fine.